The Grilled Cheeserie is a down-home food truck operation whose every ingredient supports and helps grow the local farming community of Nashville, Tenessee. Positive community impact through food. When we asked our friends living in Nashville who was creating and influencing their communities directly, they quickly listed The Grilled Cheeserie food truck among the tops. At first glance it might not be super clear how a food truck could create and influence a community, aside from making one of the most satisfying of comfort foods on the planet! However, after meeting them in person, meeting some of their team, seeing them in action, and obviously sampling their entire menu, we couldn’t have been more astonished by the care and thought that they take in maintaining the network of people it takes to run their business that sustainably grows, supports, and adds to it’s community. What we loved most of all was the importance Crystal and Joseph put on working closely with the farmers and producers they source ingredients from to grow their businesses as The Grilled Cheeserie's needs grew. Created by husband and wife team Crystal De Luna-Bogan and Joseph Bogan The Grilled Cheeserie food trucks and melt shop serves up gourmet grilled cheese melts and nostalgic treats featuring seasonally inspired and responsibly sourced products. Crystal and Joseph moved to Nashville (where Joseph is from) after living in LA (where Crystal is from) for a while. When they moved Crystal, as a chef, realized that the farm to table movement that had become standard practice in California hadn't quite gotten to Nashville yet. In order to change that, both Crystal and Joseph made using locally sourced, organic, sustainably grown products a requirement in their food truck venture. 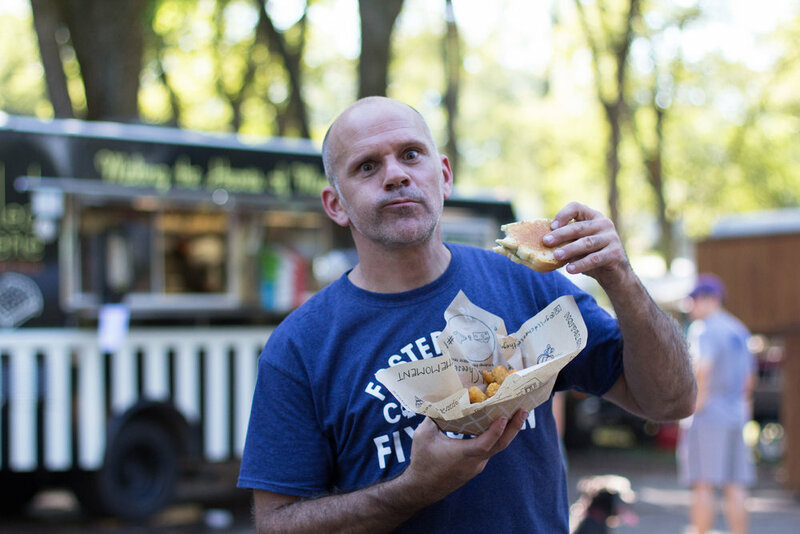 The movement has since taken off in Nashville both in the food truck world and in restaurants all through town. Crystal and Joseph quickly realized that when they formed relationships with the farmers and makers of the ingredients that they use in their food it actually tasted better. Not only were the products better when sourced locally and organically but the relationships forged through getting to know them became as important as the final product. The bakery that they use for all of their bread grew as they grew and even hired a new baker with the addition of their second food truck. As the food trucks became more popular, Crystal and Joseph were able to get a second truck and keep one at the Nashville Farmer's Market 5 days a week while the other one holds steady court at the 12 South Farmer's Market and other special events. Serving food along side farmers that grow and sell the same products used in their food is a huge part of why The Grilled Cheeserie has chosen to be a staple at the markets. You can visibly connect ingredients, faces, farms and goodness all in one place right in front of you. Here Joseph and Crystal take us on a tour of the 12 South Farmer's Market in Nashville, Tennessee. Make sure you research what you want to do and start on an approachable, smaller scale so that you can succeed. Slowly bring people into your business and movement as you grow. This will create community and will allow you to keep moving towards your goals without being overwhelmed.